On many instances, the musical and sport elements of the fall come together simultaneously. This past weekend in Albany, New York was a true celebration of the Northeast. After Phish embarked on a nationwide tour that brought them across the American continent, out to the Pacific coast and back again, the band closed out their tour at the Knickerbocker Arena (You know, The Pepsi Arena). For the band it was a return to home, where they could see their friends and family (All four members of Phish grew up in New York, New Jersey or Massachusetts and schooled in Connecticut, Massachusetts, New York and ultimately Vermont), and enjoy a climate they were accustomed to. Even more so, the band had a rocky return home from their celebrated Pacific run. After reaching a peak with their performances with Warren Haynes and Phil Lesh in California, the band unfortunately had to hear about quasi riots and massive arrests at both their Iowa and Illinois concerts during their voyage home. A return to New England would guarantee a mellower scene and less headaches and public relations disasters. In an interview with Life Magazine in 1996, guitarist Trey Anastasio described the beauty of the great Northeast, "Vermont has everything to do with who we are. Simplicity and slowness. And cold. People here are in no rush to get anywhere. And neither is Phish." Besides the comment about being "cold" ( for the band is hot as hell), this statement pretty much describes the continuous musical process known as Phish. Beyond the presence of the band in Albany, there was also a widespread celebration for New England sports. The New England Patriots are surprising everyone by maintaining a winning average while the New York Mets and Todd Pratts 10th Inning homerun raised the Mets above the Arizona Diamondbacks. Meanwhile the Yankees swept past the Texas Rangers and the Boston Red Sox made an incredible comeback from a two game deficit. The beauty of this all was that all occurring in Albany bars, hotels room and houses over the course of the weekend. For once in a Phish heads life, they abandoned their "Trey Bien" and "Gamehenge Ranger" t-shirts or Hemp made hats to accommodate their Derek Jeter Jerseys and green Boston Red Sox St. Patricks Day Hats. For every game winning homerun or crucial strikeout that occurred over those three days, there was a corresponding Phish loving sports fan who returned the feat with a cheer. This past weekend was a period of dual passions. Gathered in small grouped throughout the Capitol Region were ardent sport and music fans. Especially with the sport of baseball, there seems to be many similarities with Phish. First and foremost, there is the simple statistical infatuation with both activities. Just as a baseball fan knows how many times a player had a strikeout, the last time they struck out and where, Phish fans know how many times they played "Wipeout", the last time played and where. Just as baseball fans follow the trials and tribulations of their season through Espn.Com, MLB.Com or Joe Shmoes Red Sox Page, Phish fans keep abreast of the bands tour through Phish.net, Phans.com or Andy Gadiels Phish Page. Just as a favorite team has good days and bad days, their fans keeps the faith and support. When Phish doesnt put on a good performance, the fans still keep on coming back as well. They say that a teams true fan is also the their most ardent critic. People love a team and criticize them beyond belief as the critiques are based on familiarity and genuine love of the team. For Phish, this same benevolent criticism exists as fans discuss missed notes, lackluster play or forgotten lyrics everywhere from Internet chat rooms, bathroom lines and small Vermont newspapers. Just as baseball players show their appreciation to the fans through charity organizations (or desire for a better tax bracket), Phish contribute to a charity in every town they play in through their Waterwheel Foundation. Further less desirable comparisons can be made with the price of tickets, the price of food and drinks within a game/concert and the occasional dealing with a drunken assholes. Unfortunately for many baseball fans, if their team was playing at 7:30 or 8:00 PM on Saturday or Sunday night; they faced a dilemma: listen their favorite band or watch their favorite team. Most opted for the band, and they were not let down. Saturday evening opened with two installments/inspirations from Trey Anastasios Tolkien/C.S. Lewis influenced epic college thesis about a land called Gamehenge, "Punch You In the Eye" and "Wilson". With these two songs, there were instant murmurs of the band embarking into a night of hearing the saga in its entirety a widely yearned for and rarely heard event. The visions of an evening of mythical lands, revolutions and beautiful princesses was quickly quelled with the opening notes of the instrumental "Guyute" and the crowds minds were quickly carried away from the land of Gamehenge and back to present day Phish. For the second set of Saturday night, the crowd was treated to a night of extended loose jams in songs such as "Free", "Limb by Limb", "Simple", "Down with Disease", "Also Sprach Zarathustra" and an encore of "Slave to the Traffic Light". "Also Sprach Zarathustra", which is more commonly known as the "2001 theme", was originally composed by Richard Strauss and is played in an arrangement similar to jazzmen Eumir Deodatos version. The song allows ample opportunity for both the band and lightman Chris Kuroda to strut their stuff. 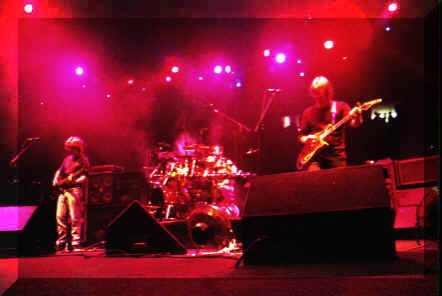 Throughout the duration of the song, the band embarks on lengthy funk-space jams (guitarist Anastasio also experiments with crazy electronic effects on his mini-keyboard), while the stage becomes completely engulfed in smoke and Kuroda performs outlandish stunts with the house lights, spotlights and overhead stage lights. After a lengthy period of improvisation, the music and lightshow jam come together simultaneously for the re-occurring musical theme that has made movies such as Stanley Kubricks "2001- A Space Odyssey" and the Peter Sellers offbeat movie, "Being There", so memorable. 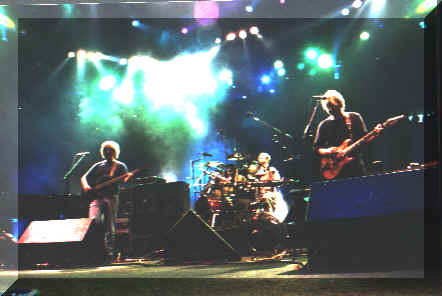 When asked by Jeff Waful in a December 1998 Jambands.com interview if the "2001" was predetermined as a jam section for the lighting show as well as the band, Kuroda answered: "No, that would have been nice, but really it has nothing to do with that. Theyre just really getting into playing those funk grooves. "2001" is a perfect place to have a good, long funk groove and jam out on it. Its a music thing." The song is a continuos favorite amongst fans and there is little doubt why. Sunday night was characterized by a whole slew of "new" songs  "Vultures", "Dirt", "Heavy Things", "Gotta Jiboo", "This is a Farmhouse", and "First Tube". To a serious touring Phish fan, some of these songs seemed as old as hell. For the older fans (or Phish virgins) who only buy officially released Phish albums and make their rare Phish concert appearances at New England shows, these songs were as fresh as the cold weather that was settling on the Northeast. "This is a Farmhouse", which first debuted on the Conan O Brien Late Show in 1997, is an unofficial anthem to the bands rural disposition while "First Tube" is an instrumental progressive workout reminiscent of 1980s King Crimson. In addition to "First Tube", the tunes "Heavy Things" and "Gotta Jiboo" were heard by many New Englanders during Trey Anastasios recent solo tour through Portland, Maine and Albany. After hearing these songs again, it was quickly ascertained that Anastasios solo tour was simply a medium for working out new Phish songs. This factor also lent to the general feeling that Anastasio was still controlling the helm of the great Phish phenomena. Although their have been a few collectively written songs and general transition towards group improvisation, Anastasio (with the help of longtime friend and lyricist Tom Marshall) is undoubtedly the creative writing force behind the band these days. There were numerous opportunities for Anastasio to show his virtuosity through his mastery of effects pedals, controlled distortion and the sparkling of textured solos, but to compensate for the disparity in the bands creative input, Anastasio attempted to downplay his guitar work. The largest piece of evidence of Anastasios "credo of non-soloing" arrived with Saturday evenings encore "Slave to the Traffic Light", which dates back to the late 1980s as being part of Phishs repertoire. The song begins with a collective instrumental, then a reggae rhythm singing section and finally, an extended escalating jam. In "Slave to the Traffic Lights" of yore, the closing jam was basically a drawn out Anastasio solo with the remaining three members accentuating the "climbing" feel to the song. For this Albany show, Anastasio chose not to solo throughout the song's climax and simply played chords to complement the songs build. The basic song shell was still there, but the internal components were significantly different. On an instrumental level, the ever-stalwart rhythm section of bassist Mike Gordon and drummer Jon Fishman are like fine wines, as they seem to improve over time. Fishmans steady polyrhythmic drumming makes its sounds like it is en easy task to play through the constantly changing time signatures and tempos that characterize a typical Phish song. As for Mike Gordon, he has slowly developed as the bands improvisational backbone through his provision of a reliable backbeat as well as creating interesting rhythmic passages that underwrite and complement the solos of Anastasio and McConnell. As Gordons bass work becomes more and more complex, the music of Phish becomes much more "multi"  multi-layered and multifaceted. A superficial glance of the band will see Anastasio as the obvious frontman, but closer scrutiny reveals an intense conglomeration of each band members input. A perfect example of this "new" Phish sound can be heard with "Limb by Limb" which appears on The Story of the Ghost and opened Saturdays second set. . The beautifully done song features a great vocal duet between McConnell and Anastasio while Fishman and Gordon add their vocals as a form of song texture. Added with a climatic end jam, the song defines the Phish experience as it displays the bands ability to create a refined song yet still maintain the Phish improvisational spirit. 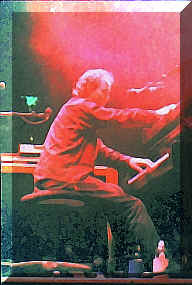 In a 1999 interview with the New York Post, Anastasio described the bands approach to improvisation: "The biggest thing is listening to each other. We spend a lot of time listening. If you listen intently, you can forget about yourself. That's a goal. Then you can react to what everybody else is playing." With regards to Page McConnell, he may be soft spoken but his vocals and mastery of keyboards, organ and Yamaha piano are often the highlights of any given Phish concert. After this past weekend, it may seem that Albany and Led Zeppelin is a perfect pair for McConnell. During last years Thanksgiving shows, the band brought down the house with a "Good Times, Bad Times". For Sunday evenings encore, the band followed up their quirky "Contact" with a "Misty Mountain Hop". In both years, it was Page McConnells vocals that brought the audience to a frenzy. Close your eyes and you could swear that it was Robert Plant up there on the stage. The highlight of the weekend came on Sunday evening when the band stopped playing "Character Zero" and Anastasio spoke to the crowd. He thanked the Phish Road Crew for setting the venue up day after day, feeding the band and crew and basically making things work so that everybody (including the band) could have a good time. Then Anastasio spoke of how the band opened a bottle of Champagne during the setbreak and during a toast, they came to the collective agreement that life could not be so good for the band if it wasnt for the fans. Once this heartfelt message was communicated to the crowd, they placed roared in cheers as they were able to witness exactly what attracts everyone to Phish in the first place: the humanity of the band. One thing that never has escaped the Phish mystique ( or anti-mystique, for that matter) is that they come across as regular guys. To me, they are four individuals who did not want to be rock stars when they grew up  they simply wanted to make a living playing music. They have successfully accomplished this without compromising their own ability to remain mainstream individuals and will continue to do so. For all of you fans who want more of Phish, there is the quickly approaching Winter tour with relatively local stops in Portland, Maine, Hartford, CT and Providence, RI and of course, the great Millennium shows down in Florida -R U GOING 2 FLA. 4 Y2K? And oh yeah, Go Red Sox!